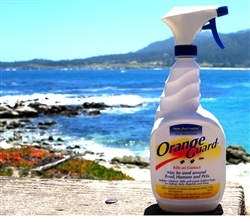 The active ingredient d-Limonene (orange peel extract) destroys the wax coating of the insect's respiratory system. When applied directly, the insect suffocates. How does Orange Guard repel insects? The citrus fragrance of d-Limonene acts as a repellent. May I spray Orange Guard on my kitchen counters? Yes, without worry, no need to evacuate the house. Easy clean up with damp cloth or sponge. Remember to read and follow directions on the label.